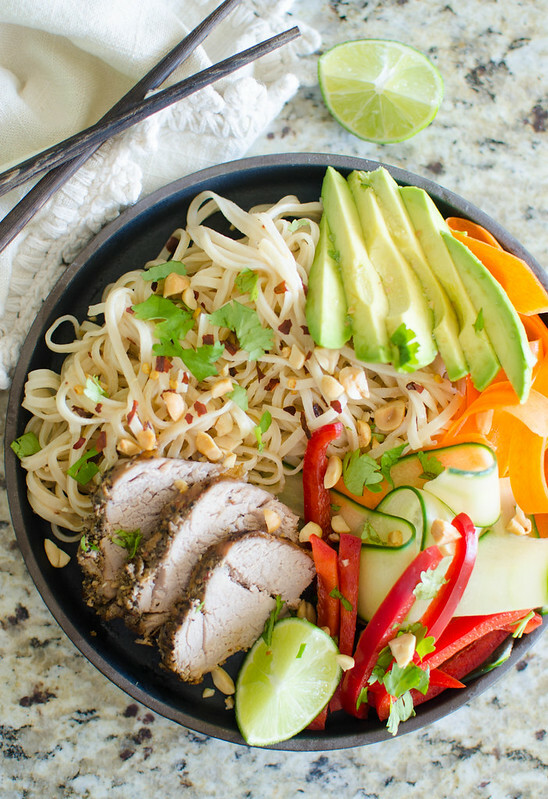 Pork Spring Roll Bowl – everything you love about spring rolls in a bowl! 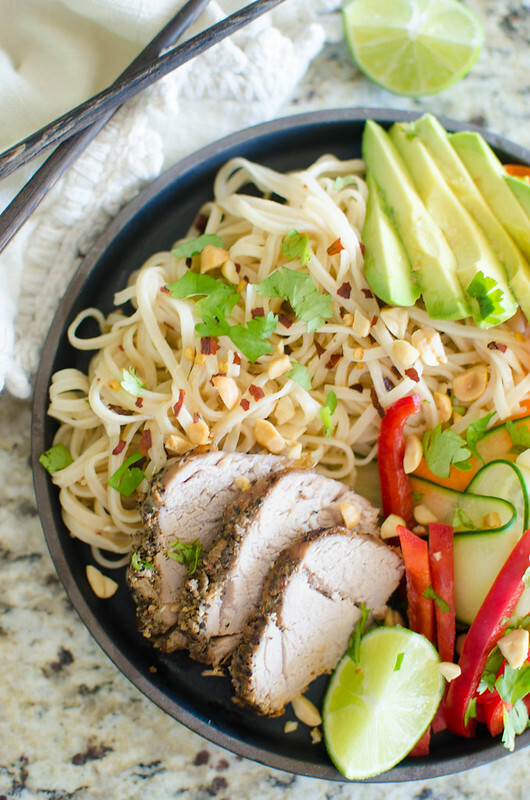 Rice noodles in a spicy peanut sauce, with thinly sliced pork, cucumber, carrots, avocado, fresh herbs, and chopped peanuts on top! Before we moved, I had this routine when my kids were with their dad for the weekend. And by routine, I mean I didn’t leave my house. I would marathon whatever season of American Horror Story fit my mood and I’d order pho every day the kids were gone. And my favorite pho place back in our old city had the best pork spring rolls. It was super thinly sliced, super flavorful pork rolled up with all the veggies and served with a peanut dipped sauce. And now I live 45 minutes from them and they won’t bring me spring rolls. So I’ve started making my own pork spring rolls and when I’m too lazy to actually roll them, I’ll do this Pork Spring Roll Bowl. It’s everything I love about those spring rolls: rice noodles tossed with a light and spicy peanut sauce, thinly sliced carrots and cucumber, fresh cilantro and mint, chopped peanuts, and the pork, of course. And the pork that I love to use in this is Smithfield Roasted Garlic & Cracked Black Pepper Fresh Pork Tenderloin. I love all the Smithfield® Marinated Fresh Pork but I I especially love the deep garlic flavor of this one for the spring rolls. 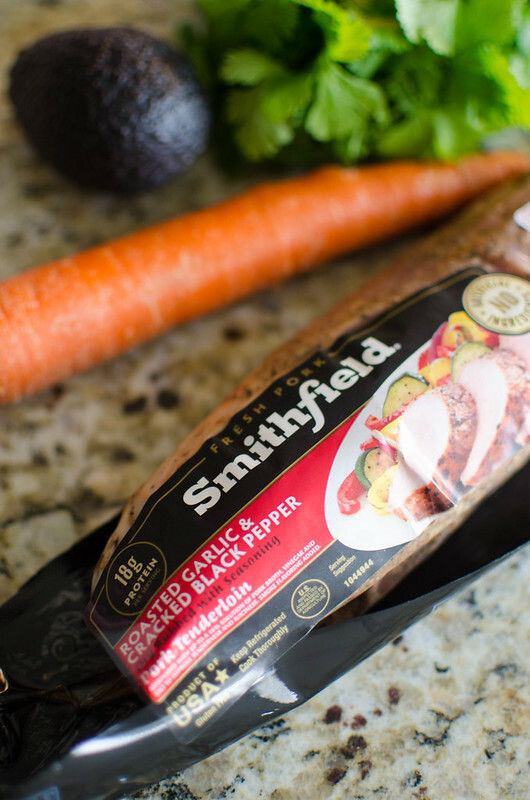 Have you tried the Smithfield® Marinated Fresh Pork? They’re my go to for easy dinners. You can put them in the slow cooker (this recipe! ), you can roast them, you can grill them, you can even cube it and put it in a skillet for super quick preparation. They’re already marinated so they go right from the package to the oven which I appreciate because I’m not prepared enough to marinate my own meat most days of the week. And, of course, Smithfield Marinated is 100% Fresh Pork and the only other ingredients are pork broth, vinegar, salt and spices. All things you can recognize and pronounce. 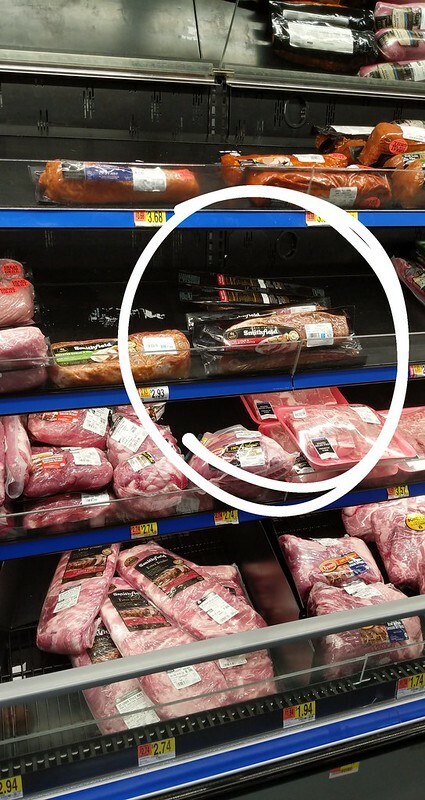 I picked mine up at Walmart and I find that they have a great selection of all the Smithfield Marinated products. Aaaaand Smithfield Marinated Fresh Pork Filets are on rollback through the month of April so they’re extra budget friendly this month! Smithfield® has a complete list of products plus some meal ideas on their site. Let me know in the comments what your favorite Smithfield Marinated Fresh Pork product is and how you enjoy it! Okay, about these Pork Spring Roll Bowls. I put the Smithfield Roasted Garlic & Cracked Black Pepper Fresh Pork Tenderloin in the slow cooker and let it go all day. The rice noodles take less than 10 minutes to prepare and then I run them under cool water. The veggies just have to be cut, no need to cook them. And if you aren’t into a certain veggie, leave it out and substitute another. I know a lot of people like cabbage in their spring rolls, but I’m not a huge fan so I do red bell peppers. I like to do cilantro and mint – again, if you don’t like them, leave them out. Basil is also delicious in this. And then a sprinkle of chopped peanuts to finish it off. These are super easy to prep ahead which makes them perfect for a weeknight meal. Especially if you put the pork in the slow cooker before you leave for work. Another great thing about the Smithfield Marinated Fresh Pork? Leftovers! You can shred the pork and put it on salads, tacos, sandwiches, literally anything. I’m a big fan putting the shredded pork into a skillet until it’s crispy and then serving it with eggs, tortillas, and salsa for breakfast the next day. Cook pork in slow cooker on low for 6 - 8 hours until cooked through but not falling apart. Remove to a plate and let rest for about 15 minutes. Thinly slice; set aside. 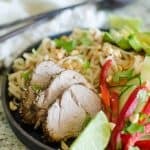 To make the noodles, combine peanut butter, lime juice, coconut aminos, rice vinegar, garlic, ginger, crushed red pepper flakes, and coconut milk in a blender and blender until smooth. Toss with the cooled noodles. 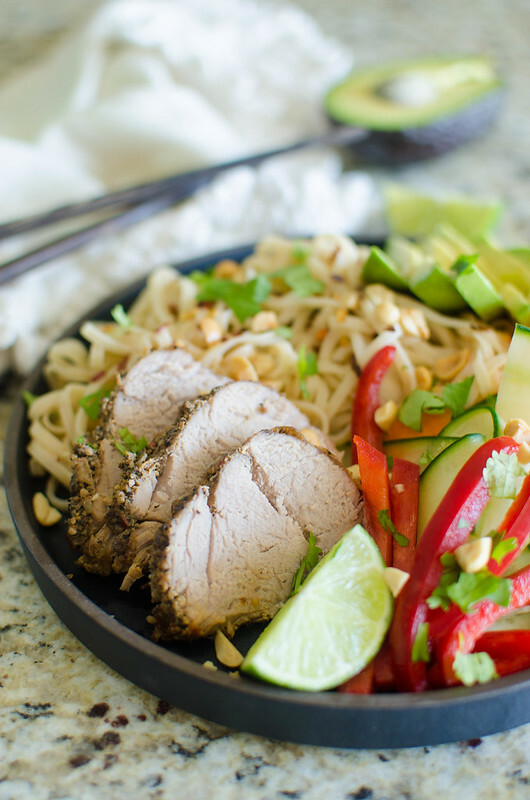 To assemble bowls, place noodles on bottom of bowl. Arrange cucumber, carrot, and bell pepper slices around the edges of bowl. Place pork and avocado slices on top. Sprinkle with herbs, chopped peanuts, and crushed red pepper flakes. 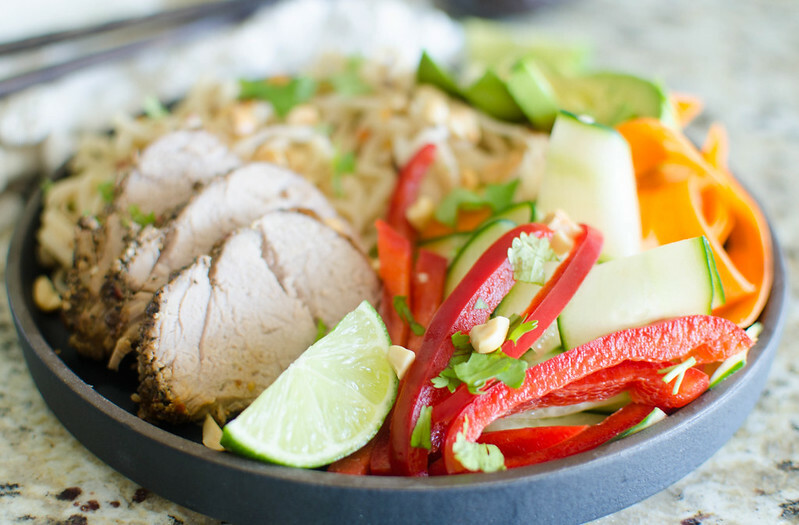 10 Responses to "Pork Spring Roll Bowl"
I love the idea of turning spring rolls into a bowl! This is packed with so much freshness and pretty colors! And that peanut sauce sounds soooo good! OBESSED! Love this recipe so so so much! The flavors together are out of this world! Colorful and flavorful. My kind of dinner! You have outdone yourself with this dish. I can’t wait to make this! I can’t to get my hands on that Roasted Garlic & Cracked Black Pepper Fresh Pork Tenderloin!! Talk about packed full of flavor!! This just made me hungry! Saving! Crockpot candy is such a classic! Love this! I love everything about this meal! Looks really flavorful and delicious! Such a gorgeous meal! Love this recipe! These look absolutely fantastic. I have hardly tried any recipe of pork and I think I;m going to try this this weekend. But tell me – is it necessary to cook the pork in slow cooker? Or can I expedite the process a tad quicker? What impact would it have on the overall recipe, etc. ?